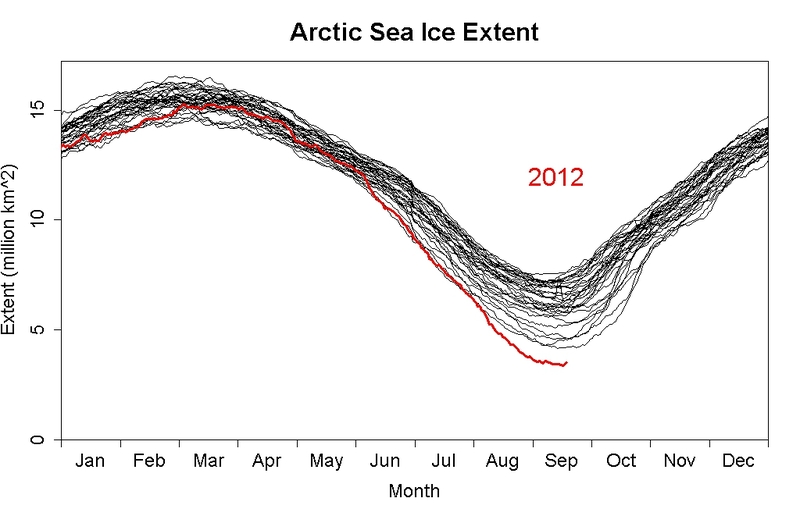 I have posted quite a bit about the ongoing collapse of the Arctic sea ice. You can view the images I assembled of the progressive loss of sea ice at Cafe Verd Arctic. Here I explain why it is important, not only to walruses and polar bears, but to human beings who don’t live near the Arctic. Keep in mind that this is somewhat simplified, because I don’t want to bog this down with complicated formulas. To be honest, the math is over my head. But the climatologists know what they’re talking about. The links lead to more detailed explanations. How well a surface reflects light is referred to as albedo. An albedo of 0.0 means all light is absorbed, 1.0 means all light is reflected. Sea ice has an albedo of 0.5 to 0.7, meaning 50% to 70% of sunlight is reflected away. Snow cover can increase that to 90%. Open ocean, on the other hand, has an albedo of about 0.06, so 94% of light is absorbed. Clearly, how much of the sea surface is covered with ice will make a big difference on how much solar energy is retained. The Arctic Ocean used to be mostly frozen over year-round. This meant that a large part of the sunlight was reflected back into space. 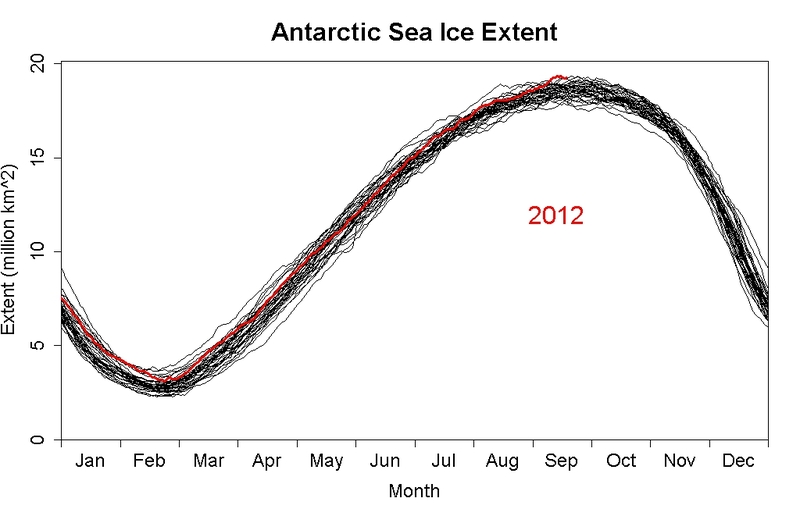 In April, 2012, ice extent had recovered to near the long-term average, but it fell rapidly in June, and by the August 26 had already broken the all-time record minimum in extent*, area*, and volume. Area is most important for albedo, but the volume is based on how thick the ice is. First year ice is thin, less than a meter. If it survives the summer melt, it gets thicker over the cold winter. Old ice can be five meters thick, but most of the ice remaining is only a year or two old, which melts rapidly in the spring and summer. This graph shows how the current warming is a departure from the norm. Courtesy of Suffolk County Community College. As the air temperature in the Arctic has been increasing, the summer ice extent has been falling. With less ice cover, more of the sunlight goes into heating the sea. That carries over—not only does new ice form later in the fall, it is weaker in the spring. All the ice is exposed to warmer air above and warmer water underneath, so the thin ice disappears quickly and the thick ice gets thinner. We have gotten to a point, by all measures, that this feedback process is likely irreversible, a tipping point. That is, even if the air temperature stopped increasing, even if the Arctic started cooling again, the ice loss would continue for many years. The only thing that could slow the warming now would be a major volcanic eruption, which would act to reflect some sunlight and cool the atmosphere for a year or two. The amount of CO2 that we have already added to the atmosphere guarantees that global temperature will continue to rise for many years. Once the Arctic is ice-free in September, all the sun’s energy that was going into melting ice will go to heat the air and water. So the ice-free period will get longer, and yet more energy will be absorbed by the sea. The tipping point has been passed, and the process will play out until we reach a new equilibrium with much less ice in winter, and little or none in summer. Tamino has an in-depth discussion on the how these extents affect total albedo and resulting effect on temperatures at the higher latitudes, the upshot being that the Arctic decrease outweighs the Antarctic increase by a lot. That means a net positive feedback, reinforcing the greenhouse effect. So why should this matter, if you don’t live in the far north? Here we get into some genuine debate, as to exactly how these changes will affect the Earth outside of the Arctic. There is some evidence that the jet stream may be changing, meandering more and changing position more slowly, which causes weather patterns to remain stuck, leading to more severe droughts and storm events. Changing temperature differentials may lead to more outflows of cold Arctic air to surrounding areas, causing some places to have colder winters while the world as a whole warms. Exactly how the ice loss will affect the globe is unknown, but there is no doubt that there will be disruptive changes. The tremendous decline in Arctic ice is an indication of the severity of climate change/global warming. The sea ice collapse is a tipping point. As we will not be able to reverse the process, we must deal with the consequences. However, there are other tipping points approaching. The sooner we get serious about reducing CO2 emissions, the more likely we can avoid triggering those events. We are already committed to another degree (Centigrade) of temperature rise. If we were to continue with “business as usual” through the end of the century, we would be dealing with an increase of perhaps 6°. That would be disastrous. There are steps we can take to reduce the severity of the problem. Now, let’s get started dealing with it. *There is an important difference between area and extent: Area refers to the estimate of the actual surface area of sea ice, not including the open water in cracks, holes, or between ice floes. Extent is the estimate of the total area of sea that is at least 15% covered with ice. So extent is always larger than area. To figure albedo, it is more accurate to use area, assuming you can get an accurate measurement. Volume, of course, is an estimate of the total amount of ice, the product of area times thickness. All three measures are trending downward worldwide.